For five and a half years, these anniversary blurbs were sent out as emails, and in October, 2014, they were reformulated as Scientists of the Day and began to be posted on the Library’s website. We have written 9 anniversary notices and two Scientists of the Day honoring Darwin, but after the first, none were written for his birthday, but for other occasions; the two Scientists of the Day concerned his death and funeral, and the publication of the Origin of Species. Today, we return to his birthday, and the subject we have chosen for the occasion is Darwinian portraiture. There are many portraits and photographs of Darwin, most from the days after 1859 when he became famous. But there are five in particular that we especially like, and we thought we would share them with you. The first is a portrait made on the occasion of his wedding, by George Richmond, executed in chalk and watercolor when Darwin was 31 (first image). This is the only portrait we have of Darwin as a young man. Richmond also did a companion portrait of Darwin’s wife Emma; both are now at Down House, part of the National Trust. The second is a daguerreotype of Darwin with his oldest son William, taken in 1842, when photography was exactly 3 years old (second image). The photograph is notable because Darwin is showing the first signs of the illness that would afflict him the rest of his life. And yes, William is wearing a dress. Third is a lithograph by Thomas Maguire, done in 1849 (third image). This was one of about 60 lithograph portraits of scientists executed by Maguire between 1847 and 1852, under commission from the Ipswich Museum. The Library owns one of those portraits, of the geologist Henry De la Beche; you can see it on his Scientist of the Day post. Fourth is a photograph by Julia Margaret Cameron, taken in 1868, when Darwin was quite a renowned figure (fourth image). Darwin and Cameron were both vacationing on the Isle of Wight at the time, and a photographic session seemed a natural thing to arrange. The Library has a version of this photograph, pasted by an early owner onto the flyleaf of our copy of the first edition of Darwin’s Origin of Species. The final Darwin portrait on our list is an oil painting by John Collier, which survives in two versions; one painted in 1881, just before Darwin’s death, and the second in 1883, a copy of the first by Collier himself, that is now in the National Portrait Gallery, and which we see here (fifth image). This was Darwin’s favorite representation of himself, and it is ours as well. What is not to like about this powerful full-face portrait of the 19th-century’s most innovative thinker. 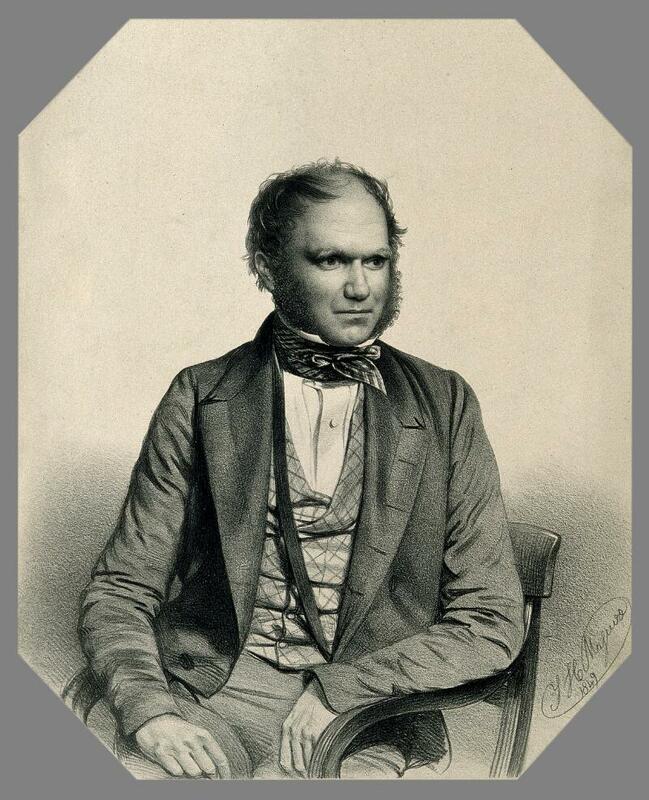 Finally, we show you one other portrait, which doesn’t quite meet the high standards of the five above, but which is special to us, because we own it: a carte de visite of around 1874, with a photograph of Darwin by Elliot & Fry (sixth image). Ten years ago, the Library fêted Darwin’s life with an exhibition and catalog: The Grandeur of Life: A Celebration of Charles Darwin and the Origin of Species (2009). The catalog is available online.